Travel in stylish comfort. 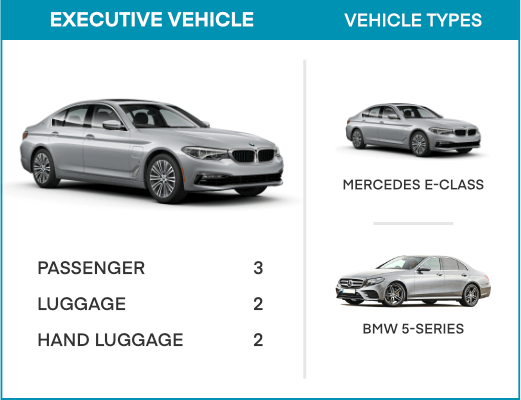 At Airport 247, Executive vehicles are available for a superior mode of travel. They have a maximum capacity of carrying 3 passengers, 2 hand bags and 2 medium pieces of luggage. Vehicles that are well-maintained and built for comfort allowing a relaxed journey no matter where you are travelling to. We can also assist in your transfer ‘to and from’ variety of seaports including, Dover, Southampton, Harwich, Portsmouth, and Plymouth. 30 minutes free waiting time for all airport collections after the requested waiting time. Meet and greet services on all airport collections. 24/7 online support to assist in queries. Child seats, diversions and stopovers can be included at the time of booking. Passengers can pre-book their cabs on our website and prepay for the journey by credit or debit card or simply get a free no obligation quote and book directly with our 24/7 call centre, you can also choose to pay on the day of the transfer journey. Travelling to or from an airport does not have to be a chore, hire an executive taxi in London today and start your journey in comfort and style.